Apricots, or Prunus armeniaca, are the fruits of the apricot tree. They belong to the Rosaceae family. This soft, sweet fruit can be savored in summer. Apricot trees love heat, and depending on the area and the variety, produce apricots in June for early varieties until August for the later ones. Grown for over 4000 years, apricots are native to China. Alexander the Great brought the fruit to the West. Apricot plants traveled by and far, in the Far and Middle East, and finally ended up with the Greeks and Romans. Romans called it “praecoquum”, which means “early”. Apricots were long to establish themselves in France. Louis the XIVth and his gardener are the persons to thank for apricot gaining popularity there. Apricots have high beta-carotene levels (2000 micrograms / 3.5 oz (100 g)), a pigment used in elaborating vitamin A that gives them their beautiful orange color. It is crucial to growth and to tooth and bone protection. It is also beneficial to skin and mucous membranes and tissues. As for eyes, beta-carotene also is involved in identifying colors. It also contributes to the defense of the body as it strengthens the immune system. Beta-carotene also reduces bad cholesterol. It is also a great antioxidant thanks to the vitamin C (10 mg / 3.5 oz (100 g)), B (0.96 / 3.5 oz (100 g)) and pro-A (beta-carotene) that watch over cell regeneration, preventing appearance of cardiovascular diseases and cancers. Apricots are 85% water. It is a diuretic and detoxifies our body. 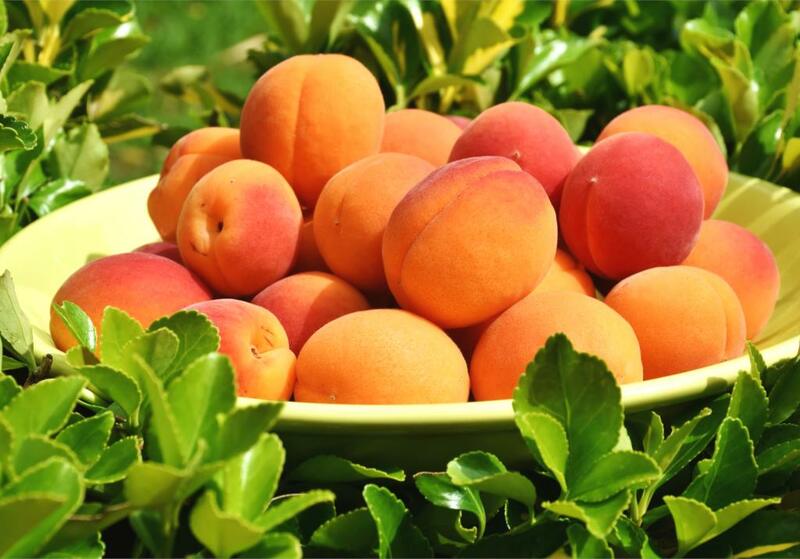 Apricots contain 2% fiber, which eases intestinal transit and soothes digestion. Ideal for burdened intestines and to eliminate toxins. 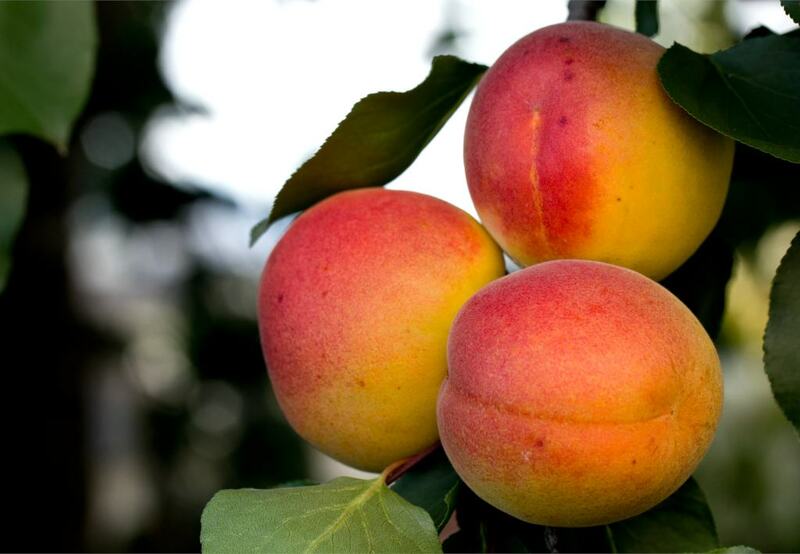 Apricot and its fibers are effective in case of hemorrhoids. Potassium (315 mg / 3.5 oz (100 g)), essential for heart muscle contraction. Iron (0,36 mg / 3.5 oz (100 g)) which takes a part in hemoglobin formation, in transporting oxygen in the blood and in cells and in the multiplying of red cells. And finally calcium (15,6 mg / 3.5 oz (100 g)) for bone and muscle health and magnesium( 9 mg / 3.5 oz (100 g)) which is a trace element involved in regulating restlessness. Sport enthusiasts love apricots, since they provide 45 kcal / 3.5 oz (100 g). On top of its energizing properties, it also reduces cramps. Apricot stone oil is an excellent anti-inflammatory. It is recommended in case of rheumatism. It soothes muscle pain as well as joint and nasal or face pain. Apricot tree leaves are an effective remedy against cough and sore throat. Indications: constipation, indigestion, anemia, osteoporosis, pharyngitis, hemorrhoids, sore throat, rheumatism. Massage apricot stone oil on the body on dry skin or after having been exposed to the sun. It is also applicable on muscle pain. Taken in infusions, apricot tree leaves soothe throat ailments and irritation. It is also good for eliminating toxins. Used as decoction, apricots soothe inflammations and skin rashes. In case of dysentery: juice extracted from apricot tree leaves and diluted seems to be effective in treating dysentery. Apricot stone seeds can be toxic if used in excessive quantities. In summer, apricots are eaten both raw and cooked. They are delicious raw, dried, baked in crumbles with sliced almonds, in syrups, in mixed or Caesar salads, in fruit salads or in smoothies. Even in winter you can savor apricots when prepared in jams. Apricots are delicious when cooked together with dried plums, with chicken, tajine, or with roast pork. In pies, apricots can be quite tangy. Lay a layer of equal parts sugar and flour on the bottom of your pastry dough. Dried apricots are a great reviver before or after physical exercise. Apricot oil extracted from the fruit’s stone has many beneficial properties for your body. It helps promote tanning, nourishes the body, tones and softens skin. Additionally, it nourishes hair and reduces hair loss. The abundance of beta-carotene also cares for your skin, since it is a powerful anti-wrinkle agent, it regenerates cells and more than anything it enhances skin tone! How to prepare an apricot mask: Blend 3 apricots, with 2 table spoons cottage cheese and the juice from half a lemon.Apply on skin and then rinse. It hydrates the skin, closes its pores, softens it and gives the skin a luscious glow. Keeping apricots – At room temperature.